First line: "Everybody knows that a seventh son is lucky." Set in an alternate historical, magical America, young Eff is an unlucky thirteenth child. Her twin brother Lan, on the other hand, is the seventh son of a seventh son - destined for greatness. She and most of her immediate family move away from Helvan Shores for a fresh start on the magical frontier after her extended family refuse to stop harassing her for her supposed bad luck. 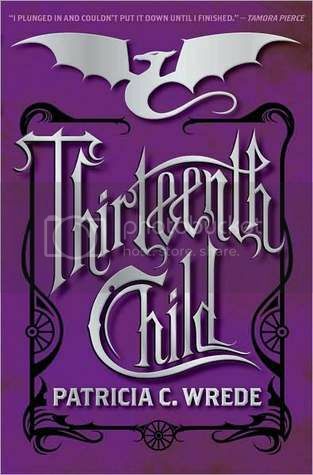 I had heard a lot about the controversy surrounding Wrede's alternative history frontier fantasy before I read it, so I settled down to read this book with some trepidation, even though I dearly love Patricia Wrede. Because her new Frontier Magic series takes place in an alternate American history, one where the United States never had a Native American population, many readers and critics were troubled. It seems deeply insensitive to eradicate a group of people who have already been through so much. And yet, reading the book, didn't feel as overwhelmingly uncomfortable as I would have thought. It was unclear to me, reading Wrede's book, if slavery had ever existed in her alternate history. While Aphrikan people (and their magic) seem to be a rare minority, no further backstory is given. I liked the idea of frontierspeople struggling to hold their own against magical creatures; mammoths, dragons, enchanted beetles. Magic, in this world, is commonplace and everyday. The Wild West twang to the characters speech added depth to the story. Eff's continual low self-esteem became a bit wearing as the story went on. She is just as worried at age eighteen about inadvertently causing bad luck to befall her family and loved ones as she was at age five, when her maliciously bad-tempered extended family go so far as to outright suggest that her parents do away with her. Some of the terms like Mammoth River (for the Mississippi) or Columbia (for America) being thrown together with place names such as Philadelphia threw me a bit. I wish that this had been set in a completely new world altogether, like Robin McKinley's The Blue Sword. I was fascinated with the Rationalists, Puritan-like settlers who eschew magic entirely. I was really rooting for them, especially after seeing how callously many of the magicians in the story treated Eff. Eff's older sister Rennie elopes with one of the Rationalists and her encampment is one of the only ones resistant to a particularly nasty strain of magical locust-like mirror bugs. So, I was disappointed when Eff finally has the chance to visit them and Rennie breaks down, admitting that life without magic is very, very hard - so much so, that she's resorted to sneaking in a spell or two to make her hardscrabble life a bit easier. On the whole, I enjoyed this book, and I'll definitely put it in the hands of young fantasy readers who enjoyed Wrede's Sorcery and Cecilia series, or the Bartimaeus trilogy by Jonathan Stroud. I'm curious too, how this book would fare as book club material for mature readers, considering there are so many different themes at play to provide fodder for discussion. Fair and honest review though, much appreciated. I might give this book a miss or try to find it in the library instead. It was definitely interesting! Worth the read. I'm debating if I want to pick up the sequel.